One of my favorite types of pudding, when I was growing up, was Tapioca pudding. It was simple to make, tasted wonderful, and you could put it together in no time. I have been working my way my Learn to Cook Series of videos, where I was cooking my way through my old Junior High School cookbook. While this recipe wasn’t in that book, it was one that had made when I in junior high school. I love this pudding, it is so easy to make. This pudding is also gluten-free, and it tastes so much better than any pudding cup. Some puddings are a bit more difficult to make, but this recipe is so simple, you will wonder why you didn’t make this at home before. 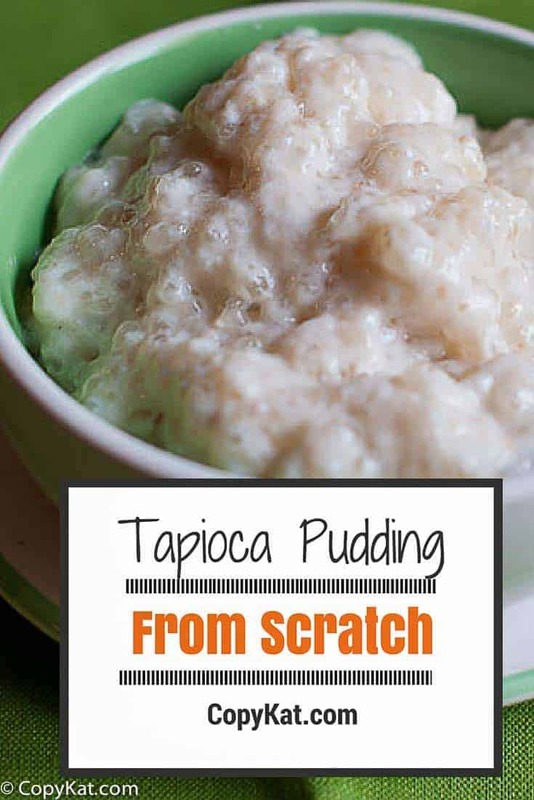 You may be asking yourself what is tapioca pudding? Tapioca pudding is a lot like rice pudding. It is vanilla pudding with small pearl tapioca instead of rice. This makes for a creamy pudding that is gluten-free. is a good value, and you use it like the Minute Tapioca. This pudding makes about 4 servings, but I promise it won’t last too long. You may want to make a double batch. Homemade Tapioca pudding is can be made in minutes. Mix milk, sugar, tapioca and egg in medium saucepan. Let stand for 5 minutes. Cook on medium heat until mixture comes to full boil, stirring constantly. Remove from heat. Stir in vanilla. Cool 20 minutes; stir. I love to serve this with a sprinkle of cinnamon, or nutmeg, or even a small dollop of whipped cream. Why do puddings get watery when you put what is leftover in refrigerator ? They all do it chocolate, vanilla, tapioca, coconut, rice pudding ? I think this happens a lot with “instant” varieties. I think it is the thickening agent that is breaking down.